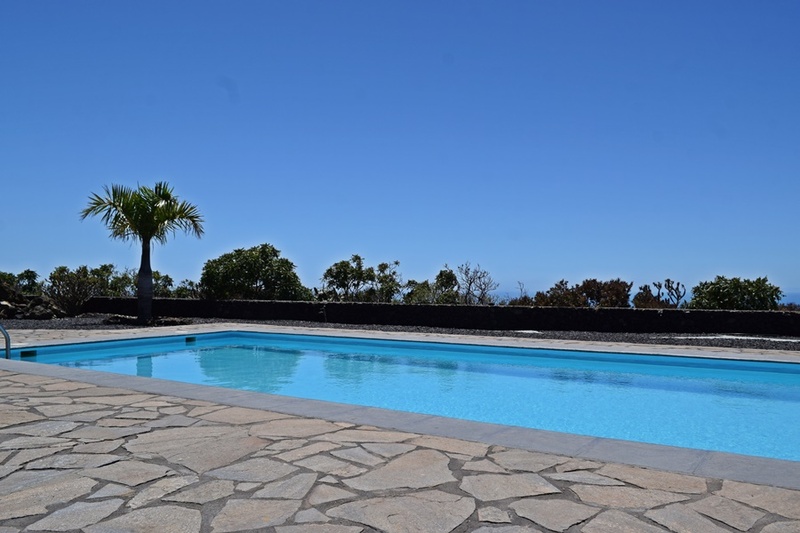 In Todoque lies this beautiful detached holiday home Monte del Rey, suitable for up to 6 people with lovely pool. 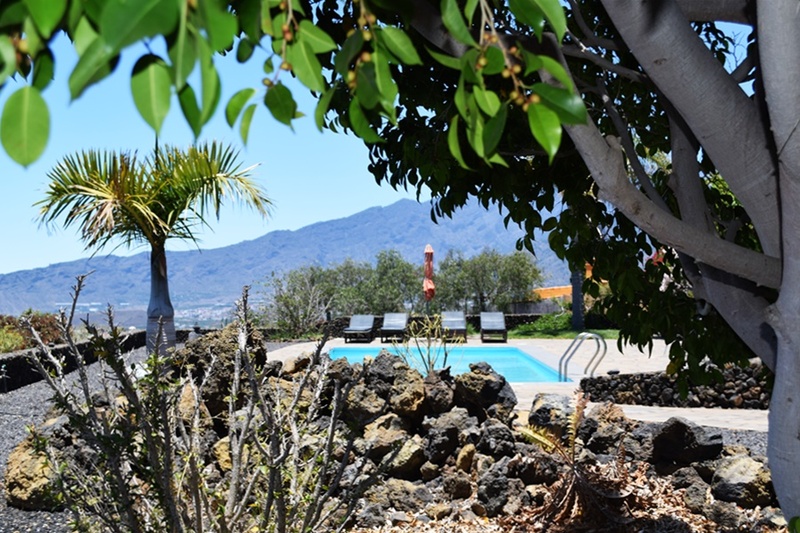 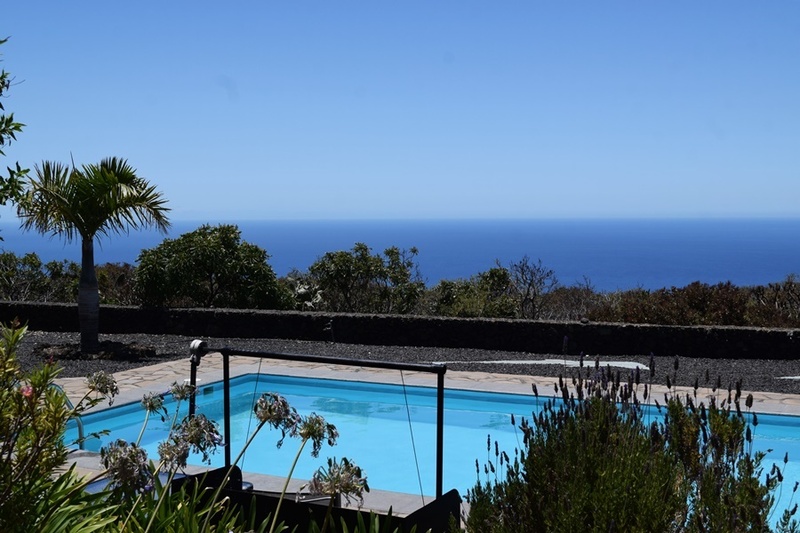 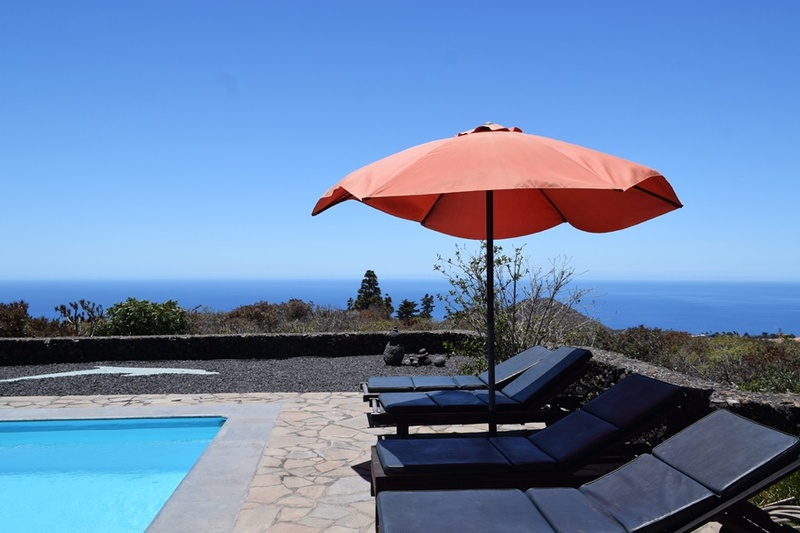 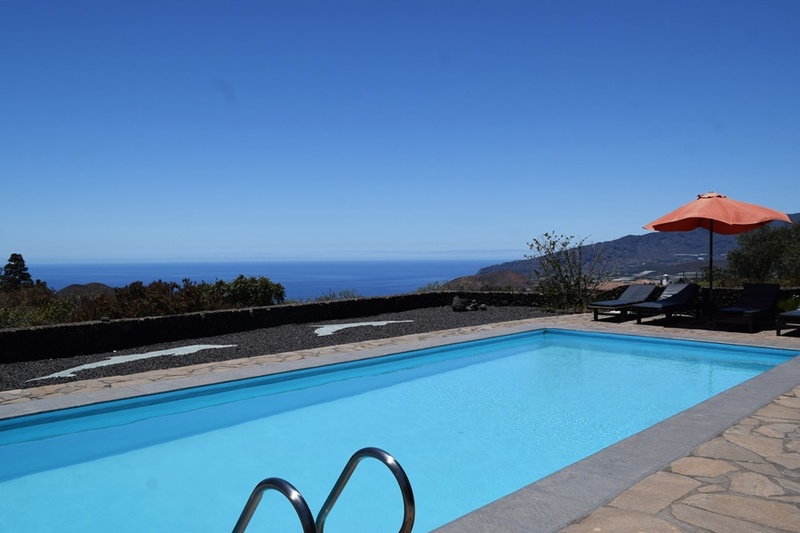 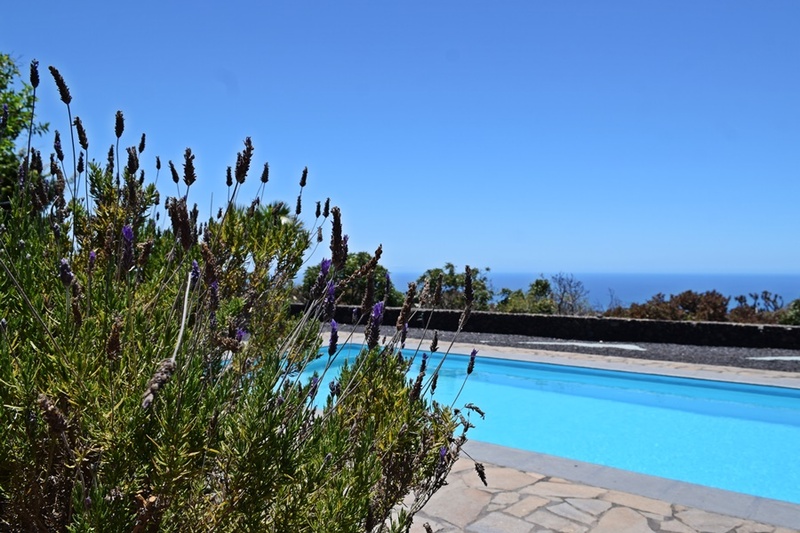 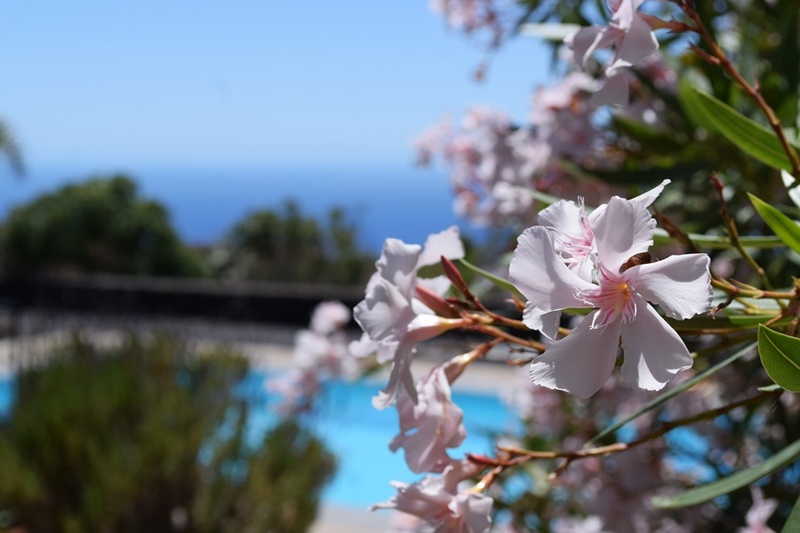 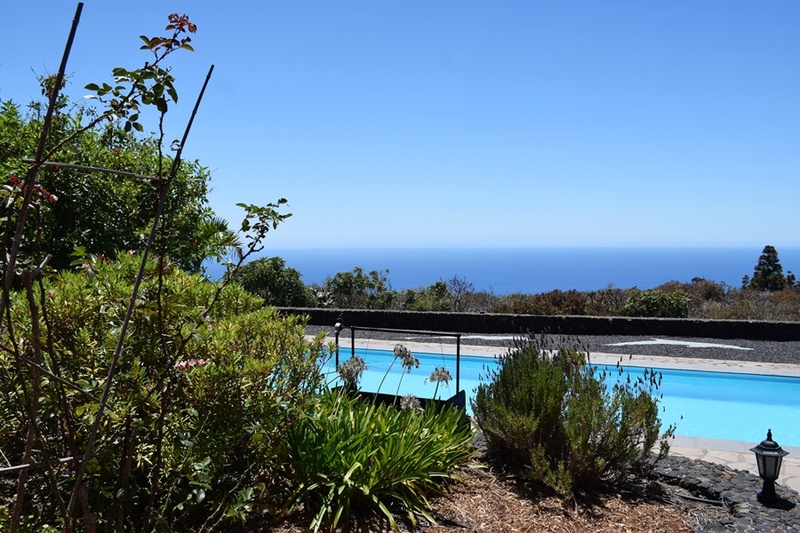 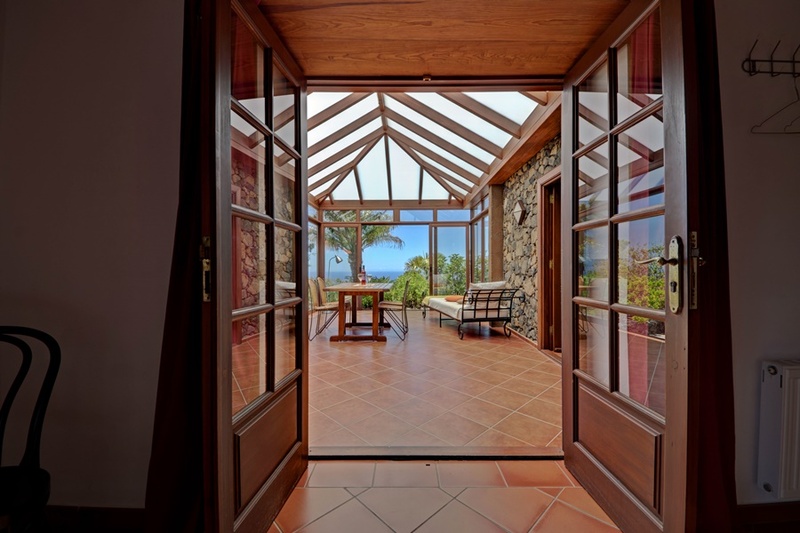 Casa Monte del Rey consists of 2 houses; the country house and the apartment, which have been built in a rustic typical canarian style. 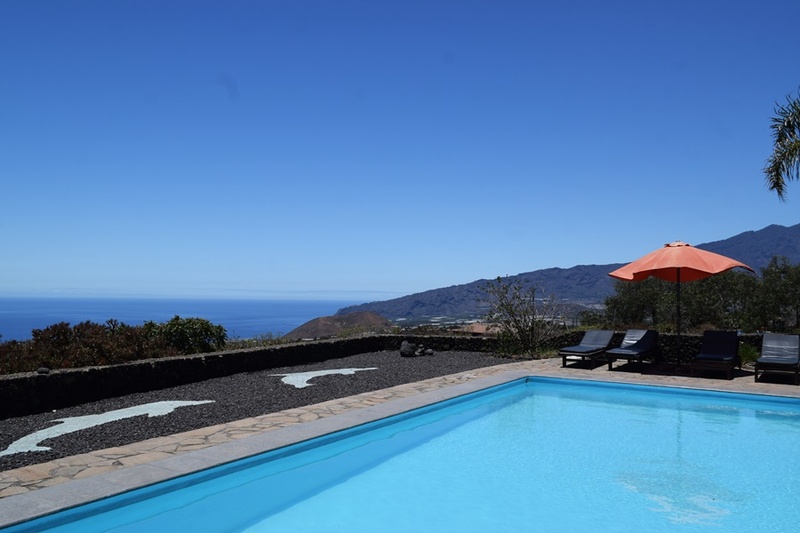 Casa Monte del Rey lies at an altitude of 400 m and on a plot of 5000 m². 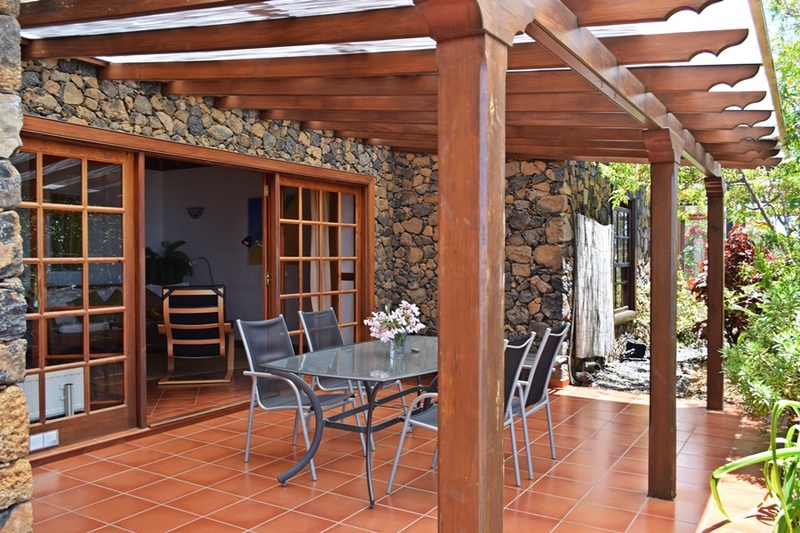 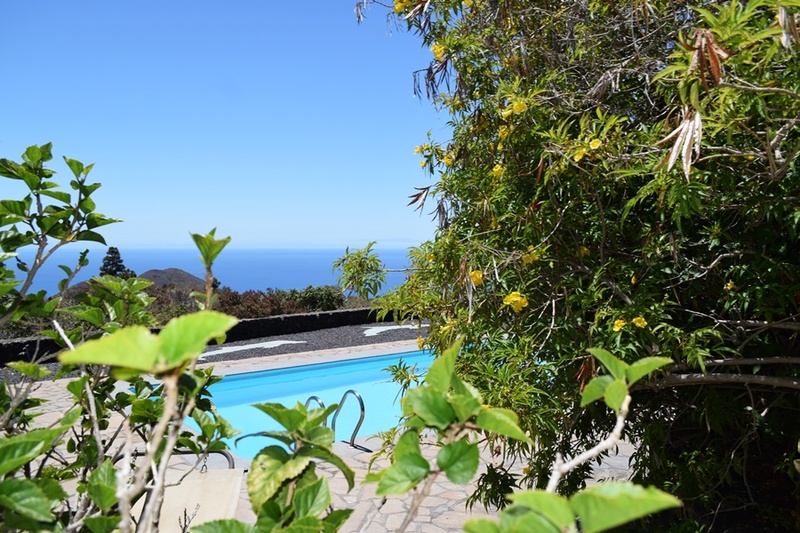 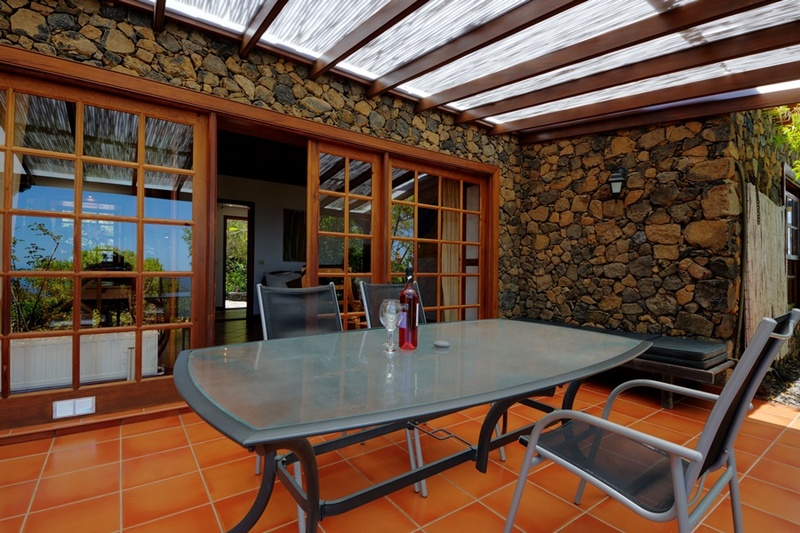 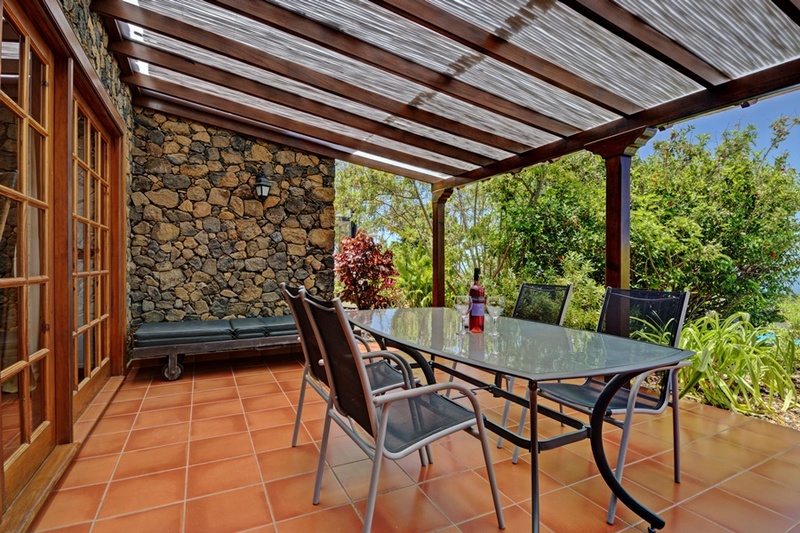 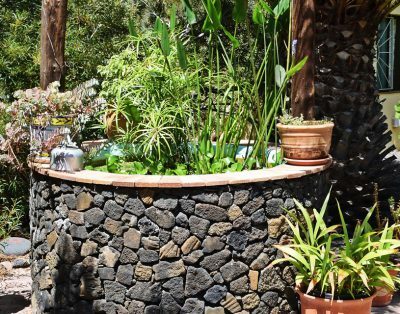 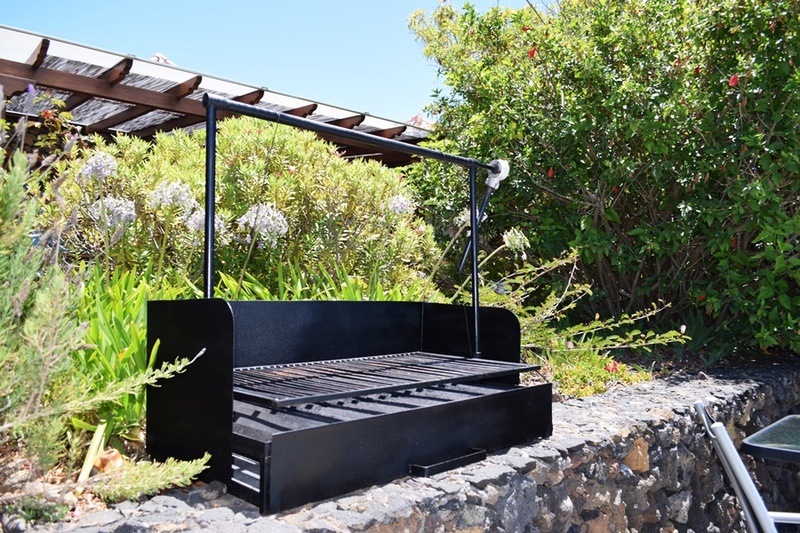 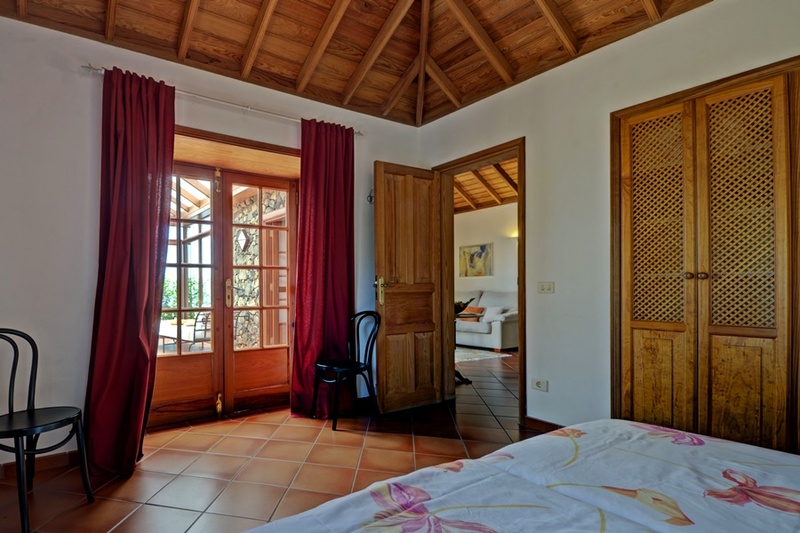 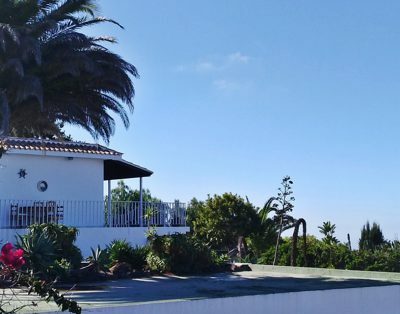 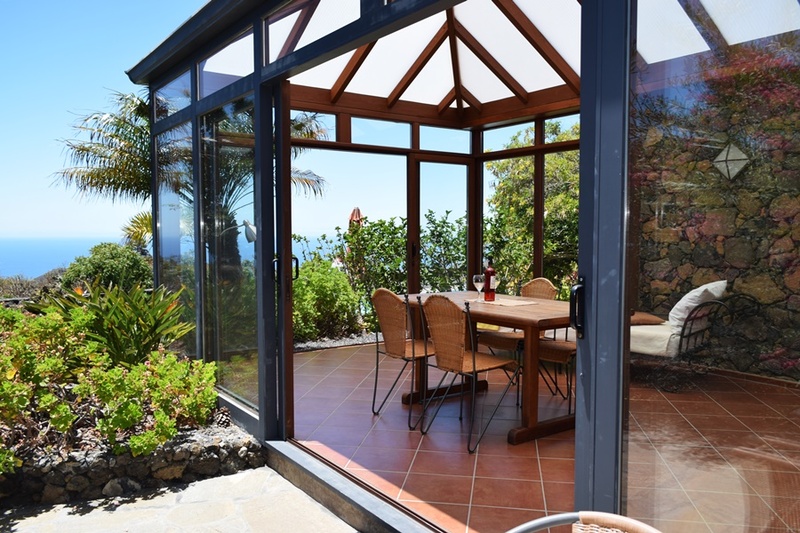 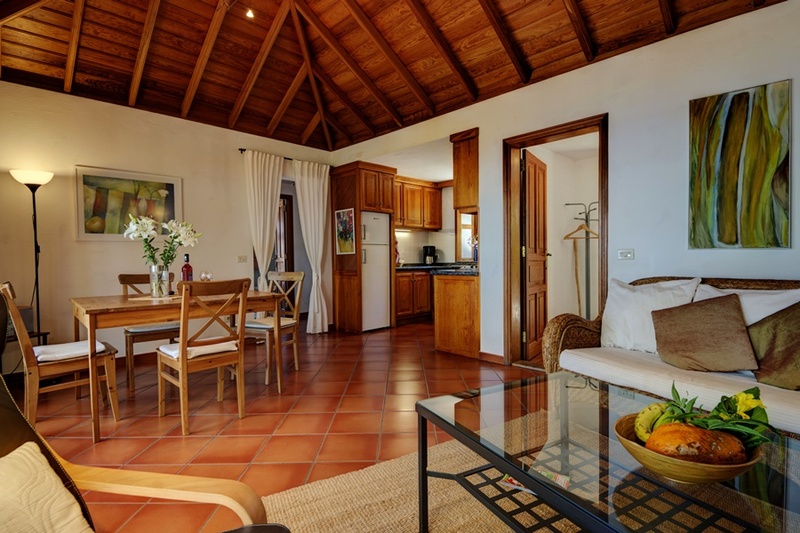 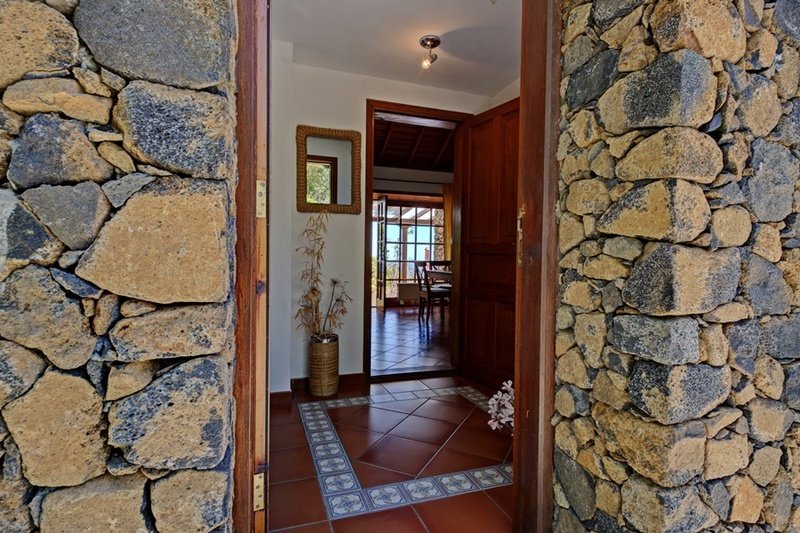 This country house, with apartment, has a surface of 125 m² and is tastefully and comfortably furnished and equipped with a beautiful wooden, typical Canarian roof construction. 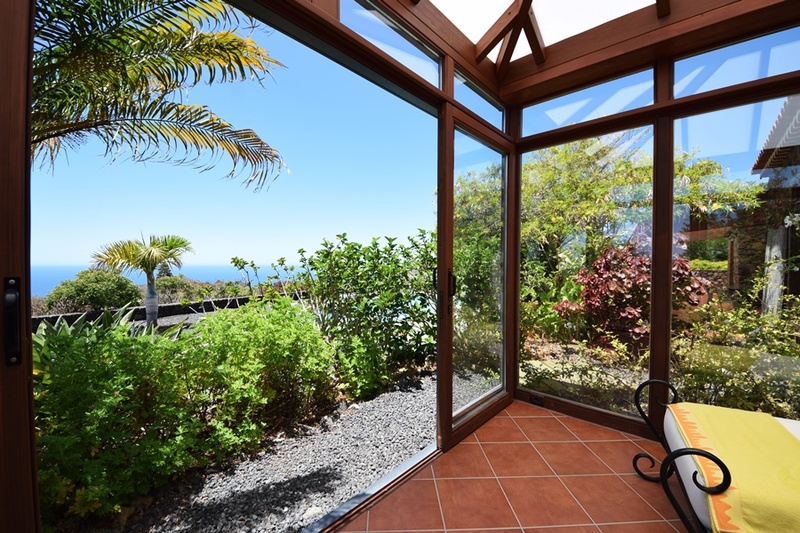 Around the house is a beautiful garden with a pool of 5 x 10 meters and a beautiful view of the Atlantic and the mountains. 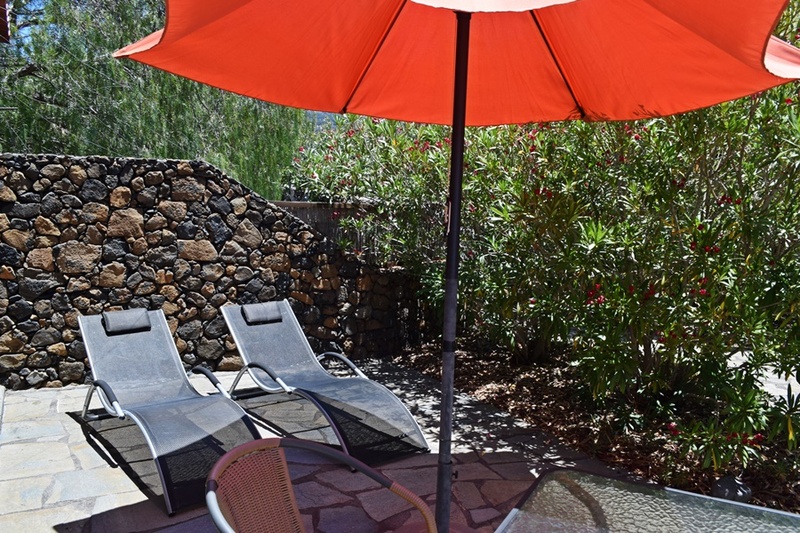 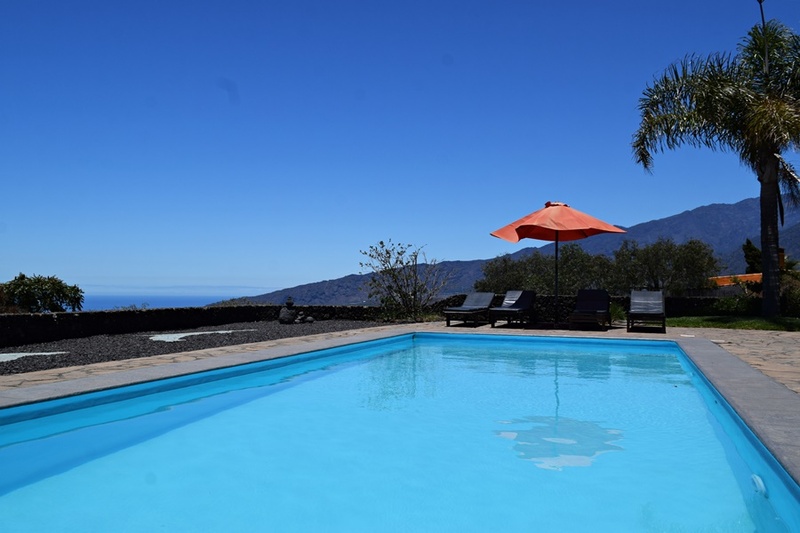 Casa Monte del Rey is located in a quiet and rural area. 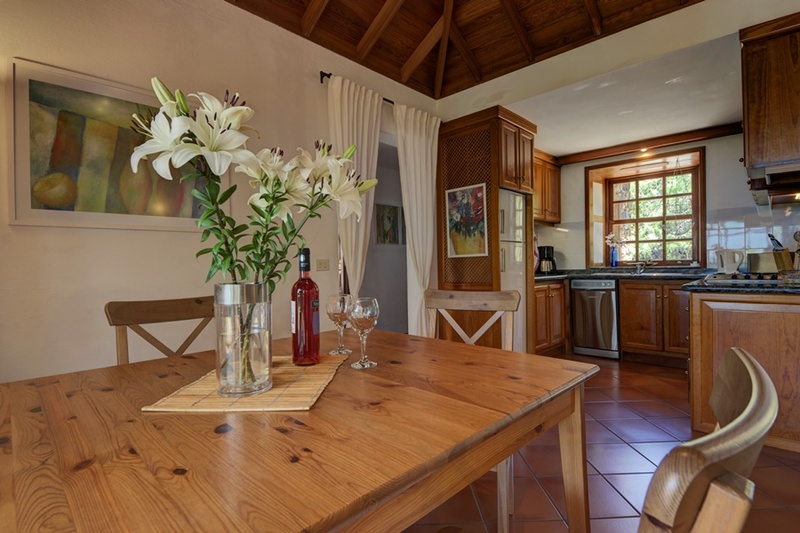 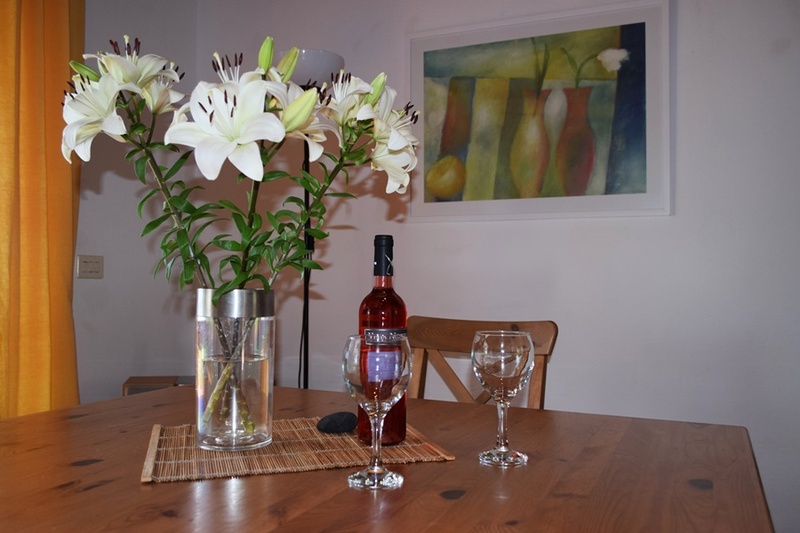 The country house is suitable for 4 people and the adjacent apartment can accommodate 2 extra people. 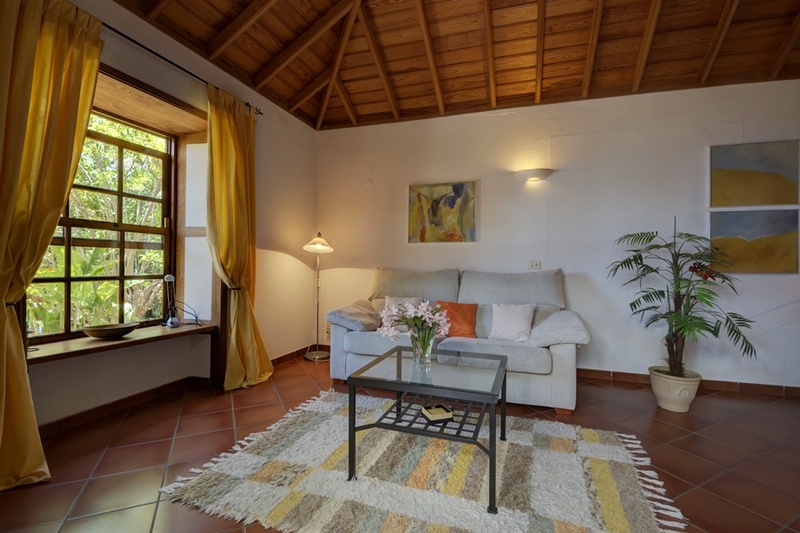 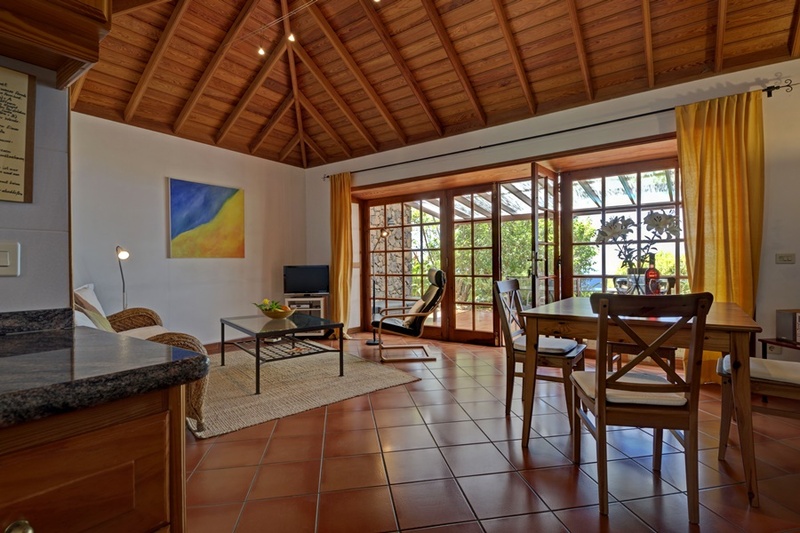 The country house of Monte del Rey has a spacious living room with internet and satellite TV (mainly German), a well-equipped open kitchen with dishwasher, 2 spacious bedrooms with double beds (2 mattresses of 90×200), a cosy bathroom with bath. 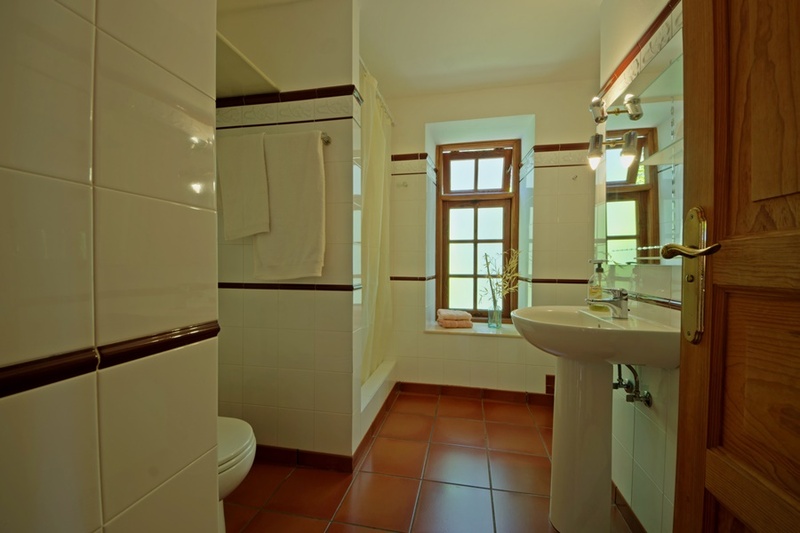 There is a guest toilet. 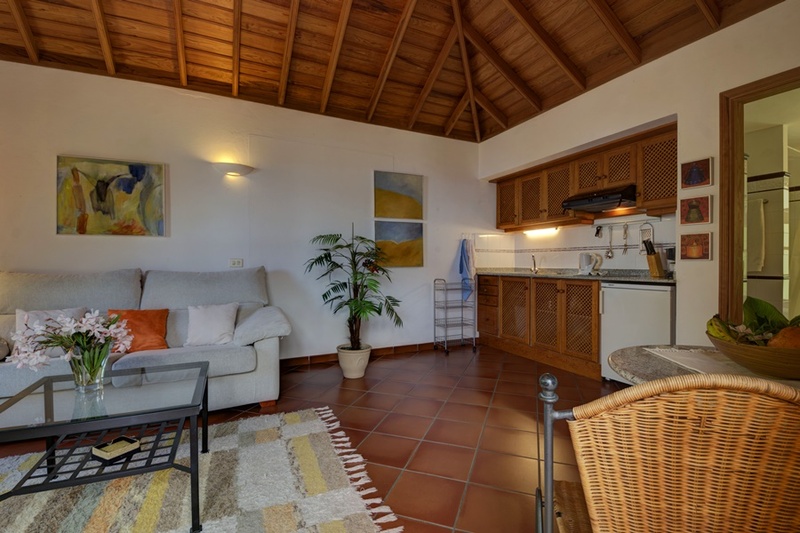 The apartment next to the main house is not rented separately and consists of a spacious living room, a kitchen a bedroom with a double bed (2 mattresses 90×200), a bathroom with shower and a lovely conservatory. 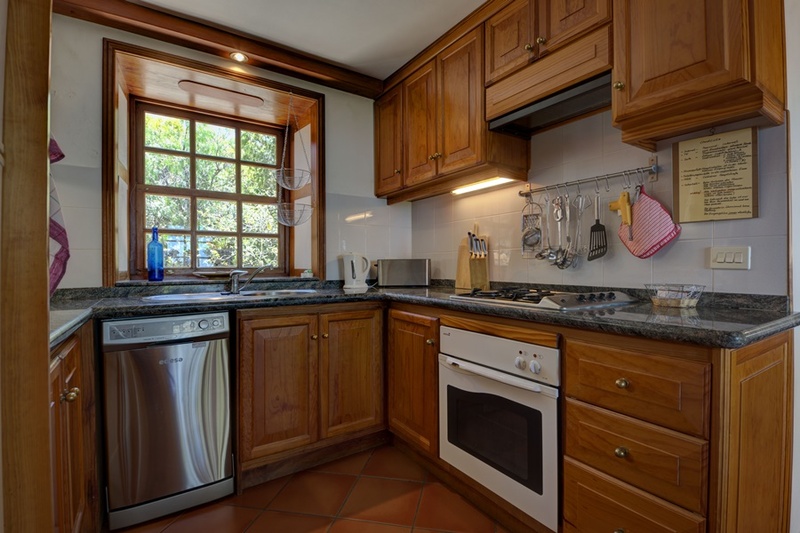 A washing machine is available for you. 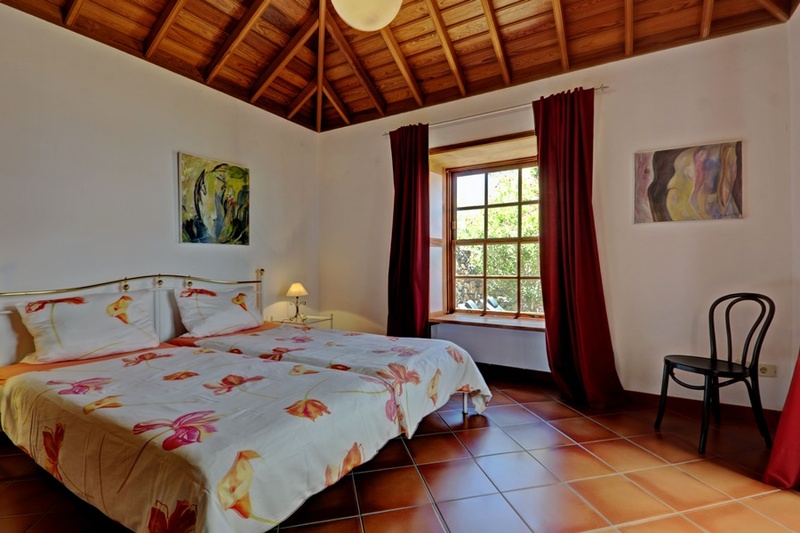 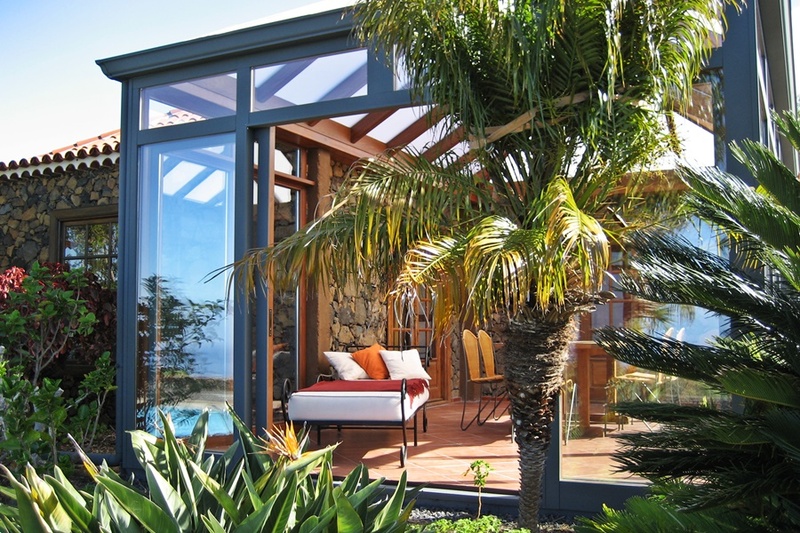 The conservatory located at the apartment can also be used if you have only booked the main house. 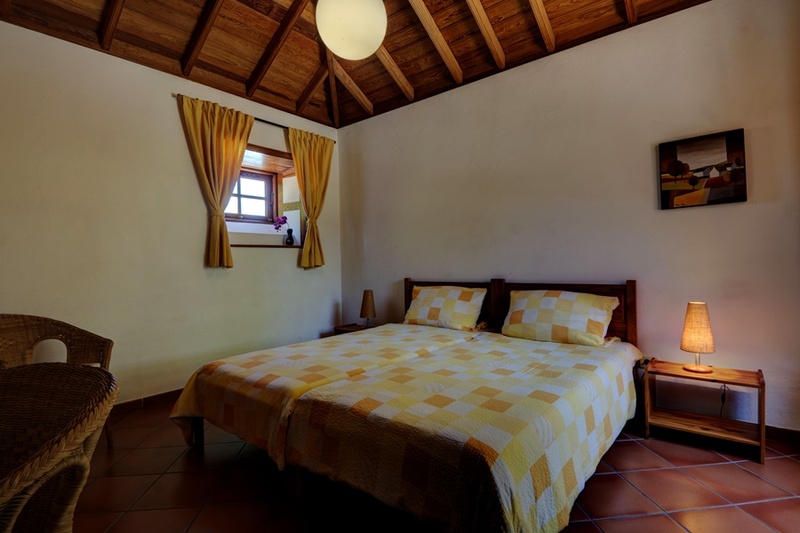 A bedroom and a bathroom are available for 1-2 persons, with 3-4 persons two bedrooms and a bathroom are made available. 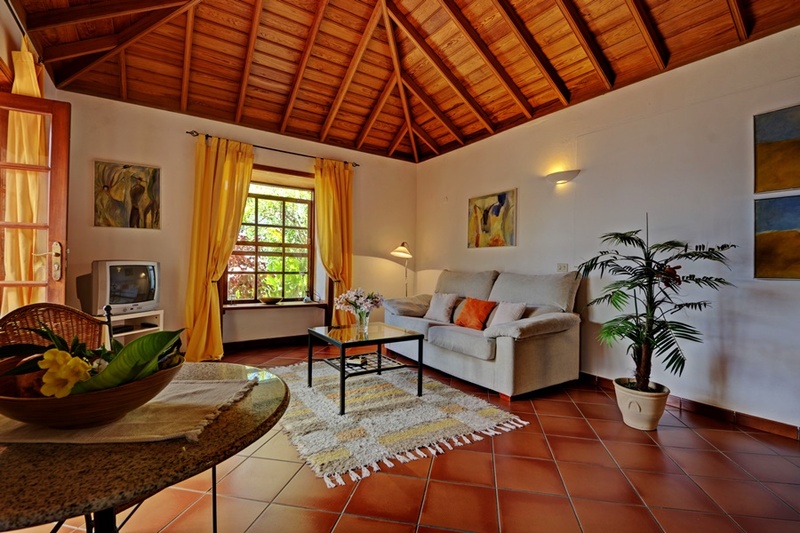 If you are coming with less than 5 people but you wish to use the apartment, the costs associated with this are € 160, – per day. 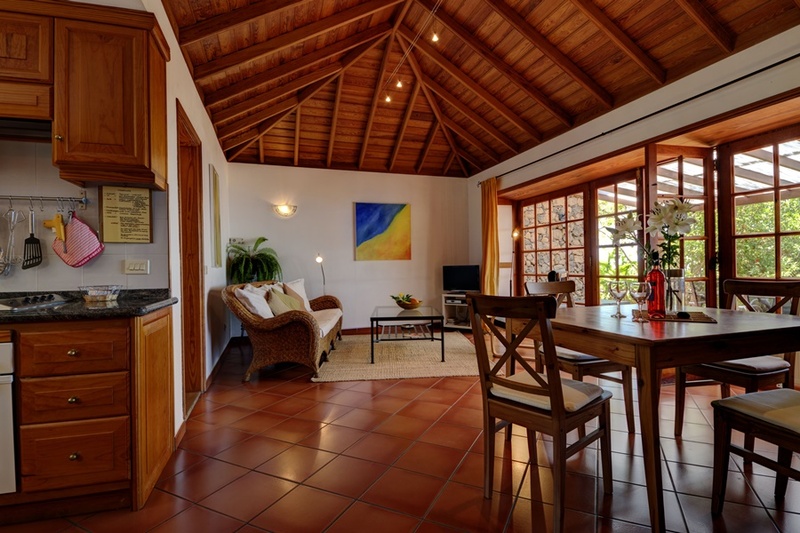 For rentals to 5-6 people you can consult the price list. 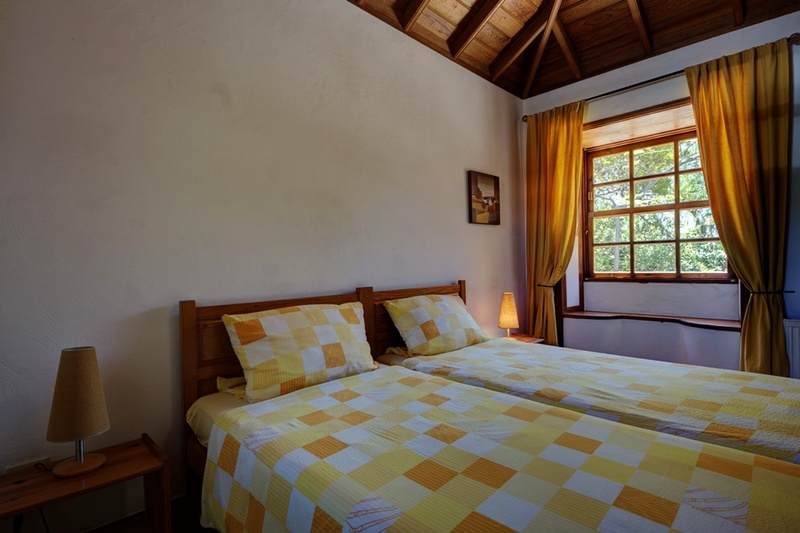 By renting the apartment you will have access to a 3rd bedroom, a second living room with kitchen and a second bathroom. 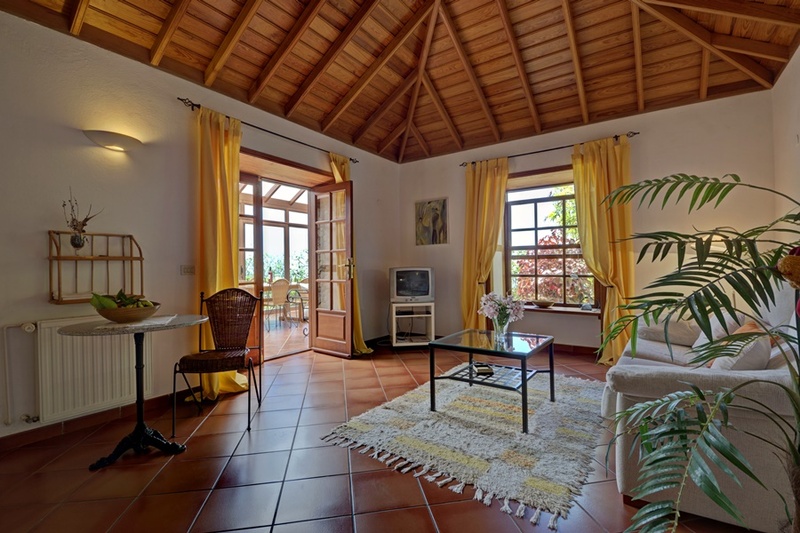 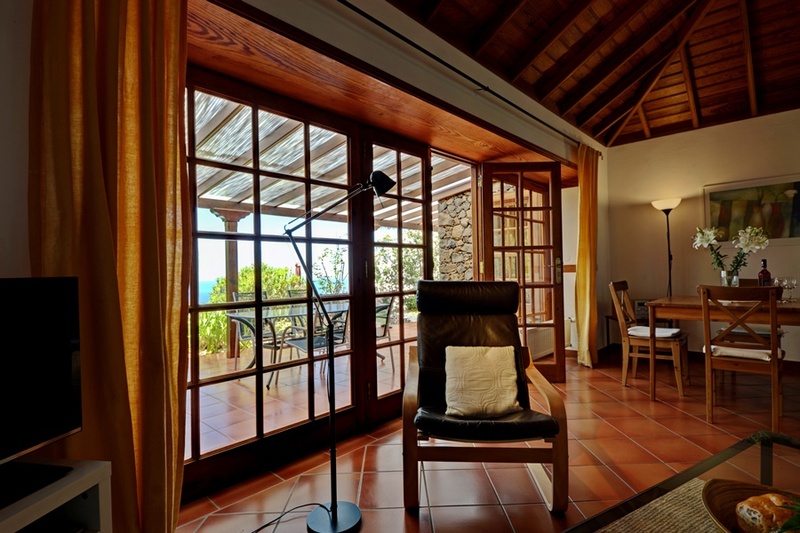 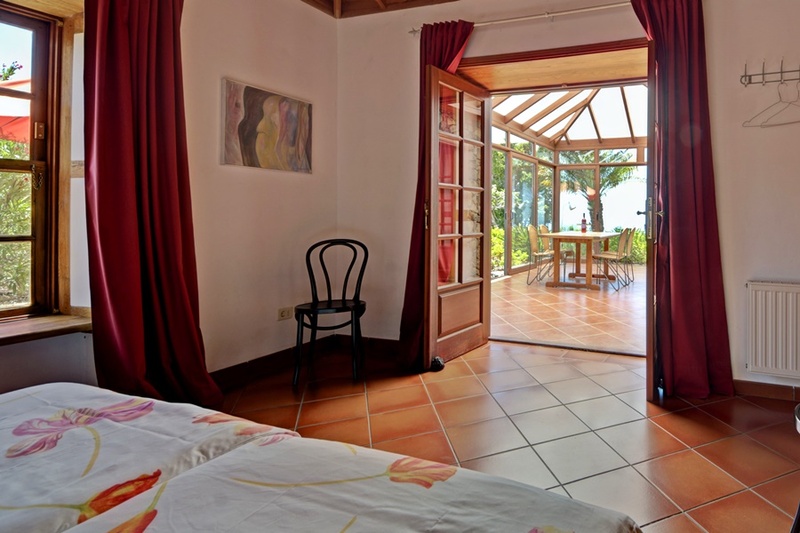 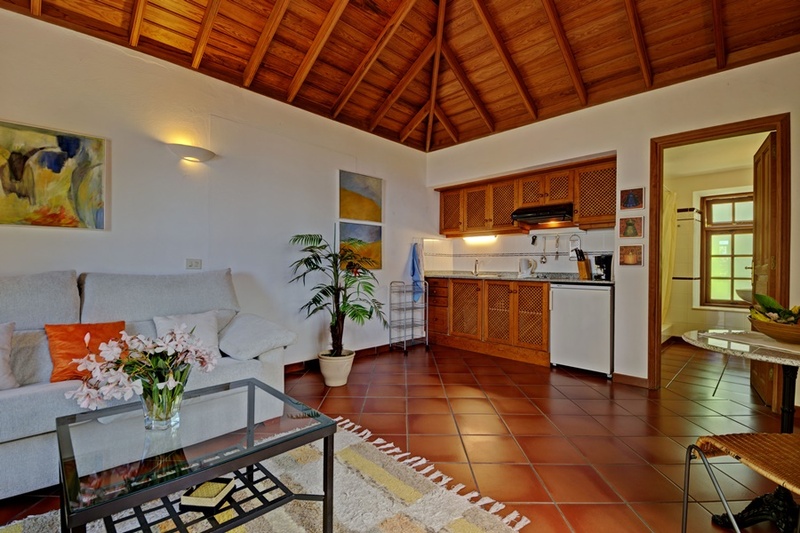 Casa Monte del Rey has internet and central heating (for the cooler winter evenings). 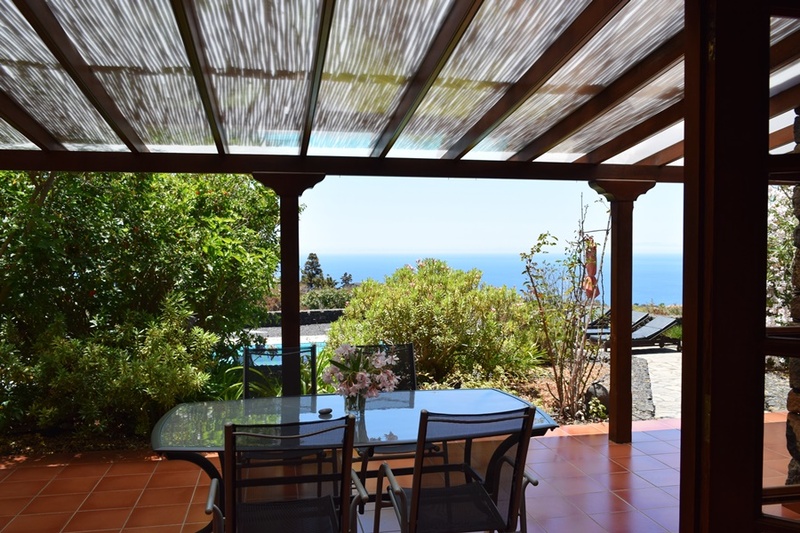 In front of the main house is a lovely covered terrace overlooking the pool and the Atlantic Ocean. 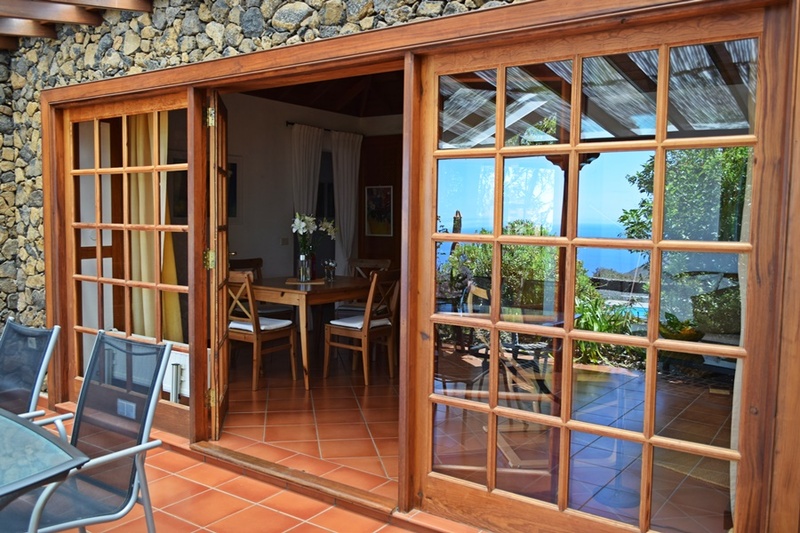 The house has several spacious parking spaces directly in front of the door. 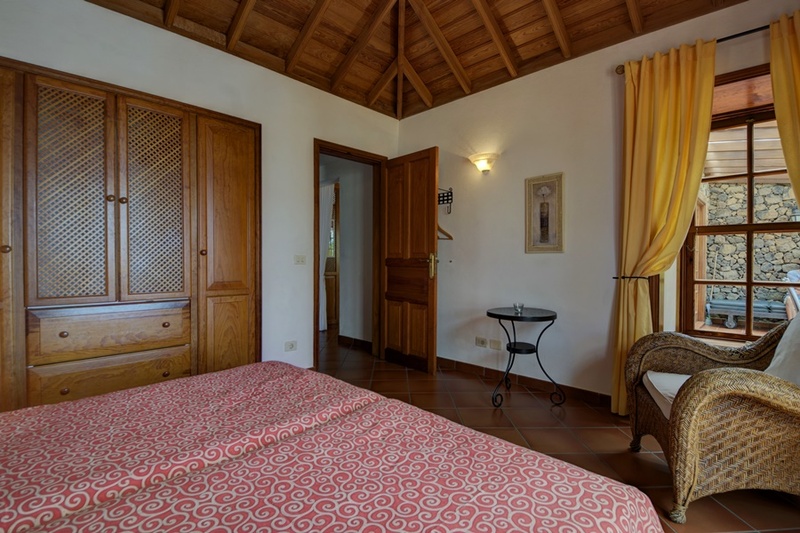 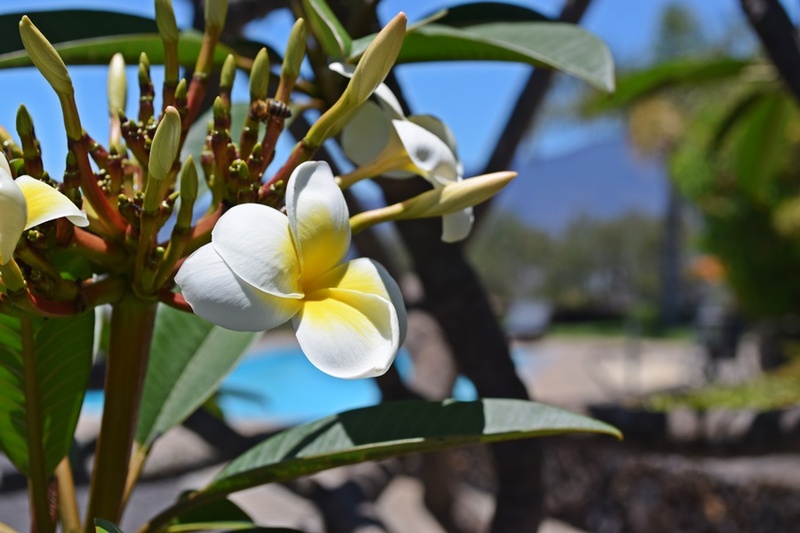 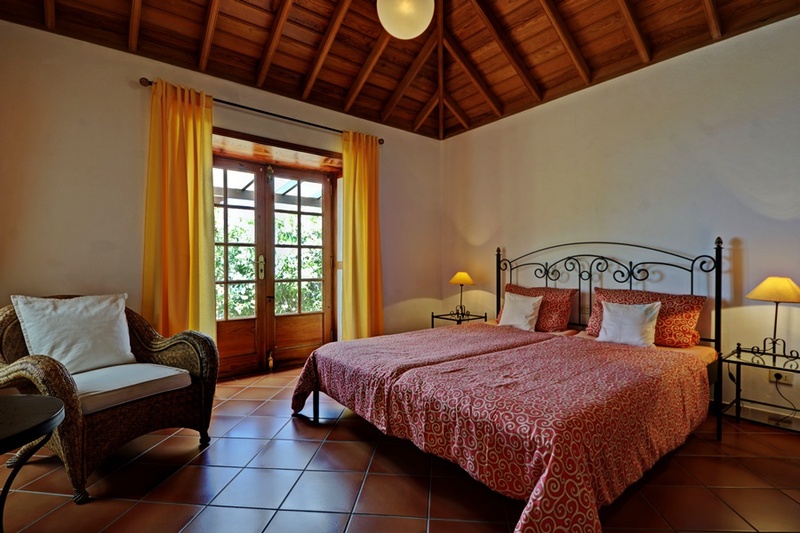 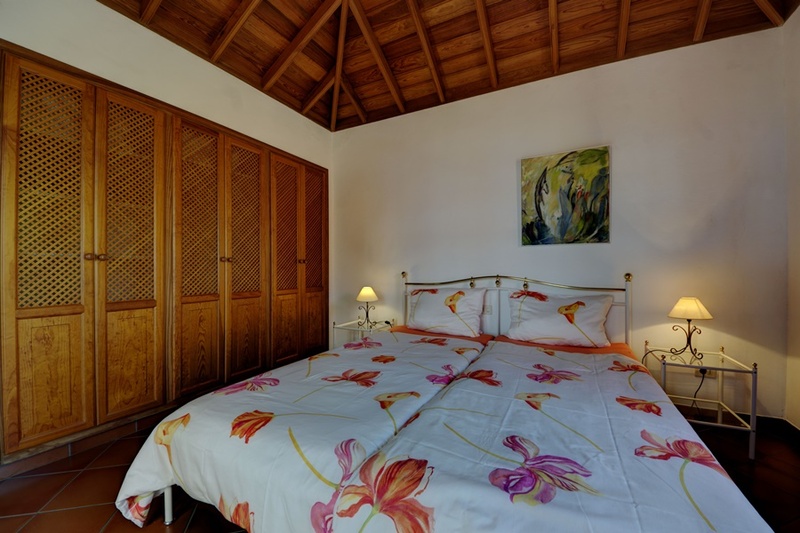 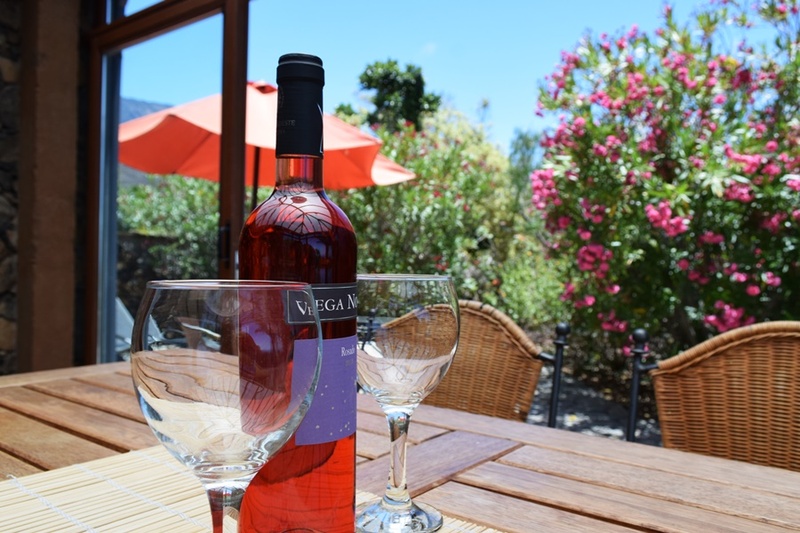 Casa Monte del Rey has a cot and high chair for children up to 2 years old (free of charge). 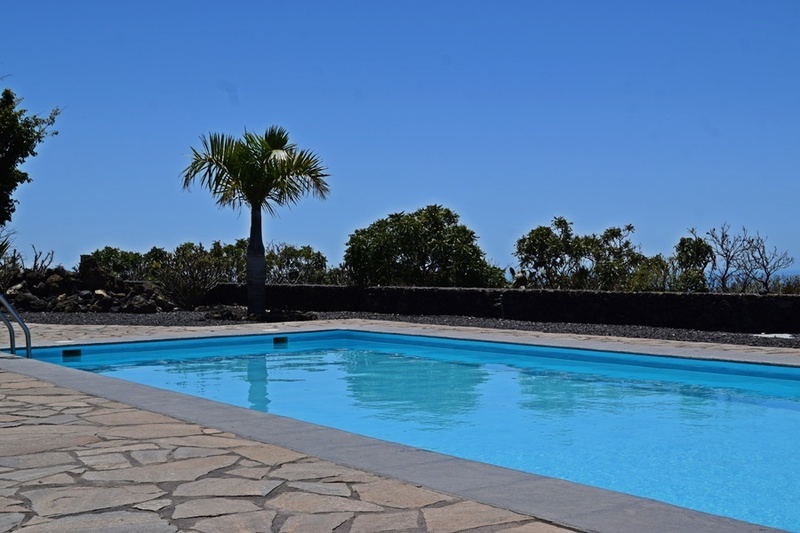 The house is not suitable for children up to 6 years, unless they can swim! 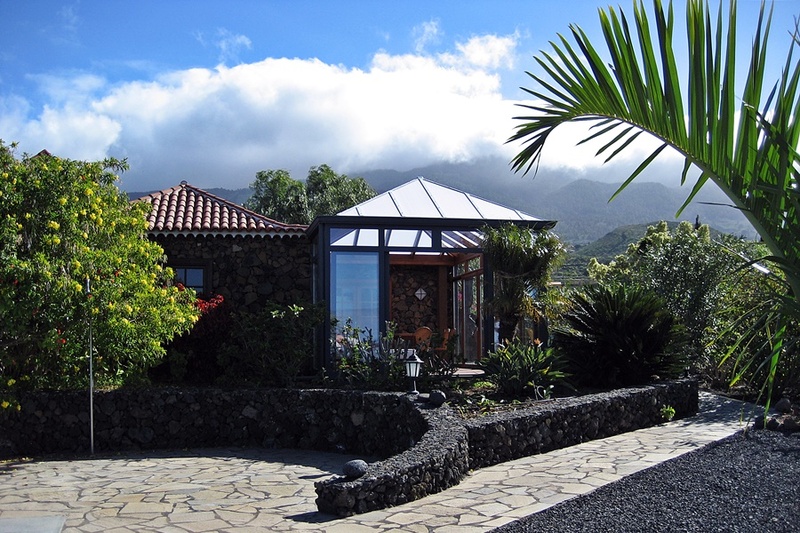 There is a small grocery store within 10 minutes’ walk. 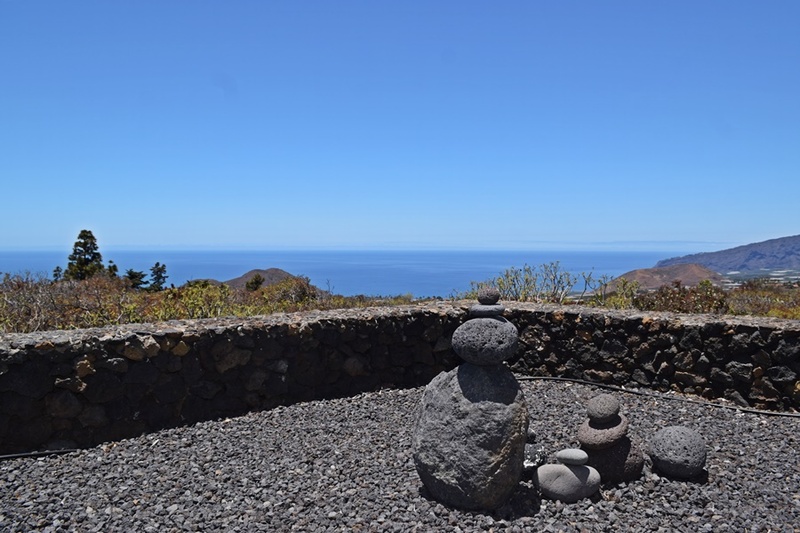 By car you are in 5 minutes in Todoque where there are restaurants, bars, a butcher and a pharmacy. 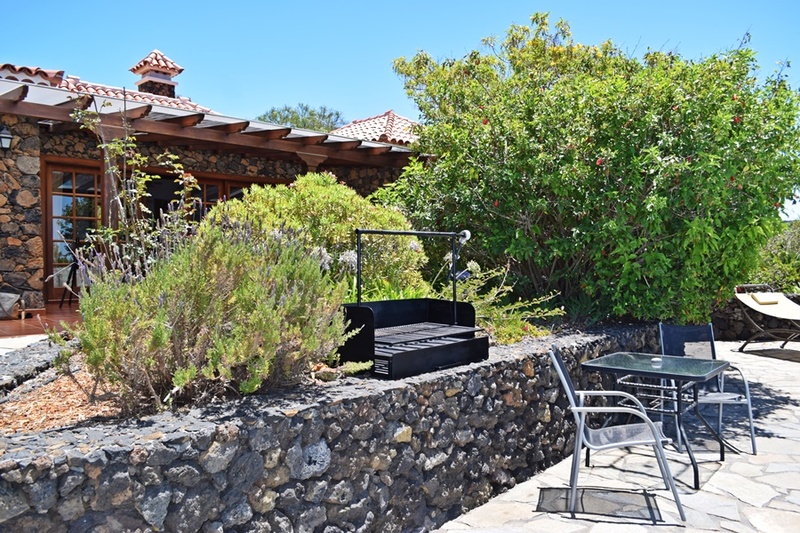 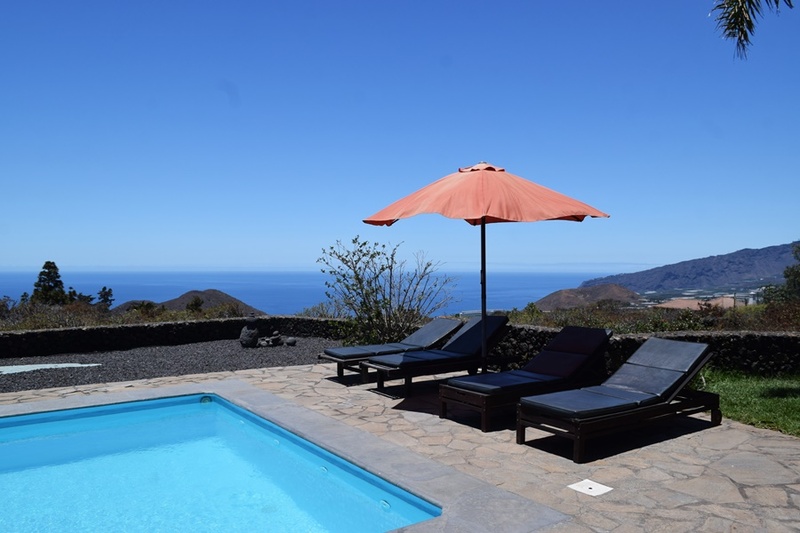 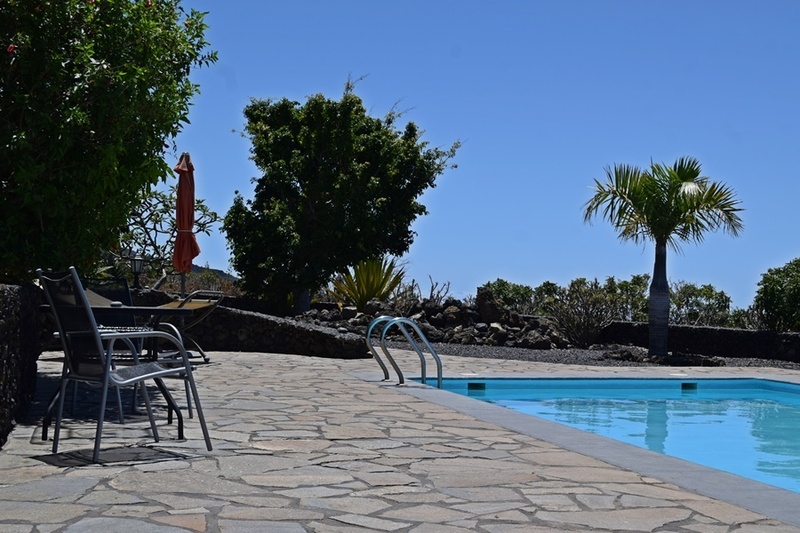 For larger purchases, you are within 15 minutes in Puerto Naos with its beach, promenade, restaurants, bars and supermarkets. 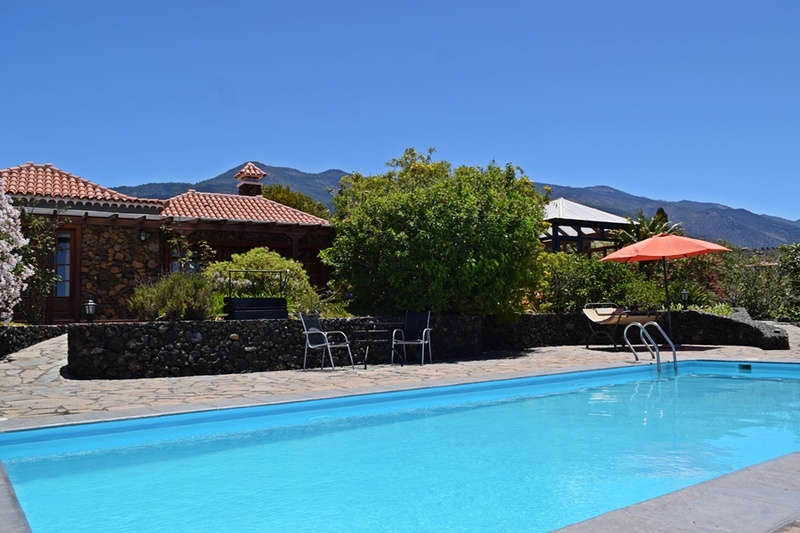 In 10 minutes you are in La Laguna at the supermarket or in 15 minutes in Los Llanos or El Paso. 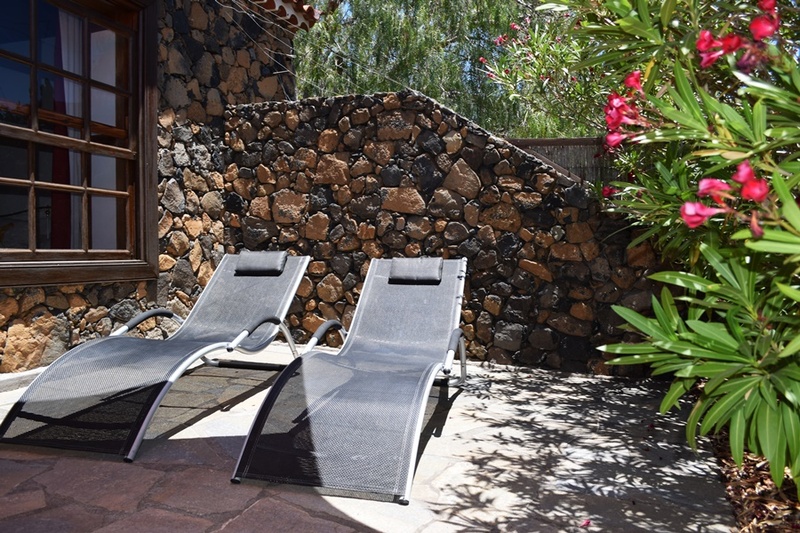 Plus 1 additional price / day (depending on the number of people, € 160 for 4 people and the apartment!) 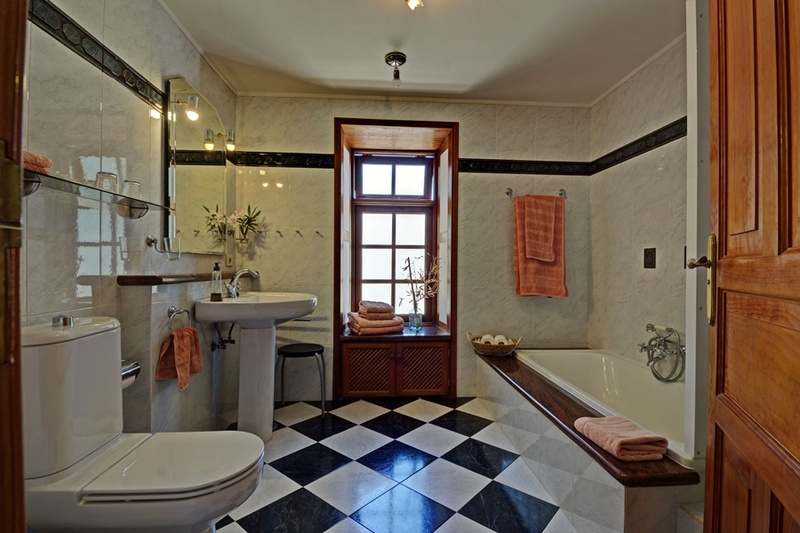 for final cleaning.